You can get these 20 oz. Leed’s Hot & Cold Tower customized tumblers for your coffee shops and stores. Get them in bulk to sell with your own brand names or blank. These tumblers have a double wall acrylic construction and they come with two lids. The cold screw-on version lid comes integrated with a straw and the hot screw-on version with a flip top lid. 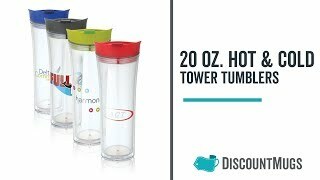 So these are perfect for your favorite hot and cold beverages. These are completely BPA free. Although they are completely clear, they come with colored lids which you can get in blue, gray, lime or red. Companies can get these acrylic tumblers to use as a marketing tool to promote their business and services. Get them printed with your logos, slogans, graphic designs or your choice of text and give them out to your customers and clients at your next promotional event. You can easily personalize your new Leed’s customized tumblers using our online tools and D-Lab system. Choose the logo, text or artwork you want to use and upload them onto our design lab. If you’re getting them custom printed, choose the imprint color you want for your font and graphics. You can also just choose to get them with no personalization at all. You are free to request an artwork proof to make sure they will look the way you want them to. Order with us today and you will get 110% price match guarantee on your new wholesale tumblers.